#FIBAOQT Semis: France vs. Turkey Full Video and Results (July 9, 2016) - Balita Boss! France and Turkey will collide for the final spot in the gold medal match of the 2016 FIBA Olympic Qualifying Tournament in Manila on Sunday. The winner of the France vs. Turkey match-up will play the winner of the other semifinal between Canada vs. New Zealand in the Finals with a ticket at the 2016 Rio Olympics at stake. Here's the 2016 FIBA Olympic Qualifying Tournament information for Canada vs. New Zealand. Tournament favorites France swept its Group B assignments by defeating host Philippines 93-84 in the opening day and surviving New Zealand's challenge 66-59. Turkey, which fell to Canada 77-69, managed to win against Senegal 68-62 to advance to the semifinals. France will hope for another big game from reigning EuroLeague MVP Nando De Colo, who averaged 17 points, 5.5 rebounds and 1.5 assists in the 2016 FIBA OQT preliminary round. Other key players for France include NBA superstar point guard Tony Parker and big man Boris Diaw. Parker averages 13.5 points, 2.5 rebounds and 3.5 assists, while Diaw averages 9.5 points, 7.5 rebounds and 3.5 assists. Another player for France that can boost their game is Nicolas Batum of Charlotte Hornets. He was cleared to play by the NBA against Turkey. On the other hand, new leaders Semih Erden and Sinan Güler will spearhead the semifinals campaign of Turkey. Erden averages almost double-double with 11 poinsts and 9.5 rebounds per game. Güler, with an average of 11 points, 2.5 rebounds 3 assists, is also expected to carry a large load offensively and defensively. Naturalized point guard Ali Muhammed, Turkey’s top scorer in this tournament, is tipped to provide backcourt stability for Turkey. He averages 12 points per game along with 4.5 rebounds and 2.5 assists. 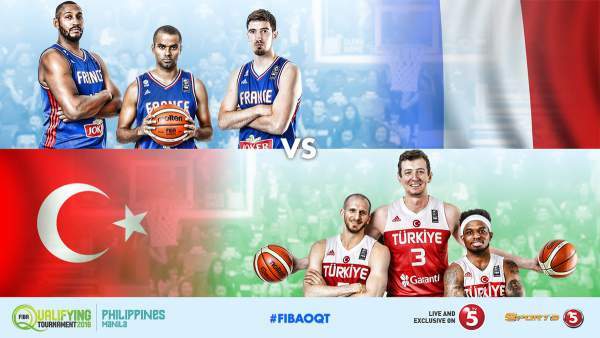 France versus Turkey will be broadcast live on TV5 and HYPER on CIGNAL in the Philippines. The official live streaming video of Canada vs. New Zealand is embedded above courtesy of Sports5 YouTube Channel. You can also watch the 2016 FIBA Olympic Qualifying Tournament semifinals France vs. Turkey live streaming via livebasketball.tv.